PROJECT_16 began at the beginning of 2015 with a simple question: ‘How would you like art to engage with your city in 2016?’. Comprised of three site-specific projects in the streets of Lahore, São Paulo and London, PROJECT_16 commissioned artists engaged with participatory practices to reflect on questions of public space and its audiences. Emerging artist Paula Nishijima (Brazil), Emma Smith (UK) and the recently created Awami Art Collective (Pakistan) propose A project for people I don’t know, Chora and Black Spring respectively, in which they directly engage audiences of their cities to discuss art, their locality and the state of the world. 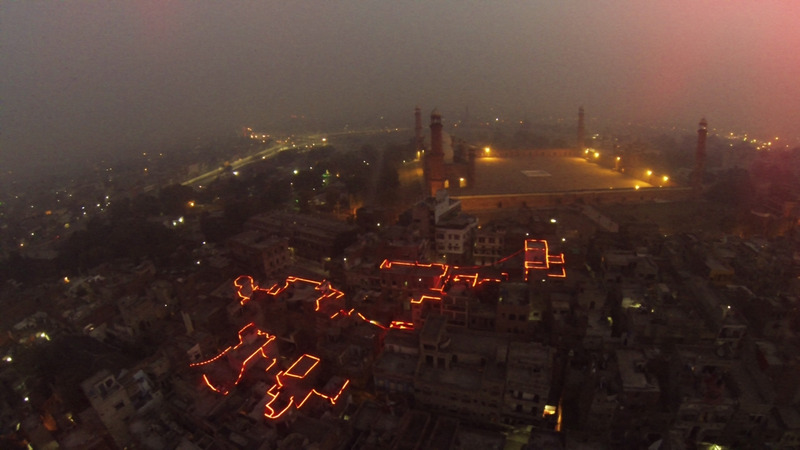 Consisting of an almost 2000m web of lights, Awami Art Collective’s Black Spring connects the rooftops of the haveli (townhouses) of the Taxali Gate — one of the entrance of the Walled City that hosts the historical ‘red light district’. The luminous orange web evokes the colour of the upcoming Metro Line and the urban development projects and government regulations, which are changing the character of this ancient city and affecting its inhabitants. Officially banned in 2011, Basant, a popular kite flying festival, is one of the events prohibited for security reasons. During Basant the local residents of the Walled City used to gather on the rooftops of the townhouses to fly the kites or enjoy the spectacle. In addition to recall the Metro Line, Black Spring was conceived as an initiative to bring back the local community to the rooftops of the Walled City to remember the celebrative spirit of Basant. To gain access to the rooftops the members of the collective gradually built a direct relationship with the local residents who actively participated in the making of the work. As a result, the intervention became an opportunity to raise awareness and share concerns on the current urban development and government regulations. On 13 February this year, the date the kite festival used to happen, the orange web installation was light up. An 11 mins. film documents this process and includes some of the conversations between the members of the collective and local residents. The memories of Basant together with the consequences of the urban developments of the area interweave throughout the conversations. Through this collection of oral history and hopes for the future of the city, the documentary bears witness to a community that thrives through collective efforts. In Brazil, Paula Nishijima proposes A project for people I don’t know. Composed of a two-day happening in São Paulo and an 18 mins. film, this work is the outcome of a two-year research project initiated with the Goethe-Institute of Brazil and developed through the collaboration with PROJECT_16’s curators. With almost 600,000 visitors, the exhibition Frida Kahlo — connections between surrealist women in Mexico at Instituto Tomie Ohtake, is the occasion chosen by the artist to engage new audiences of her city and address questions of the use of public space and the role of art. On 19 December 2015 and 10 January 2016, thirteen people queuing to get into the exhibition were selected to talk to thirteen people leaving the show. They didn’t know each other; they were connected online. Scripted at some points, these conversations between strangers created mirror-spaces to counter two different temporalities and spaces. Drawing on psychoanalysis, the action gave voice to the audience to reveal the common expectations and anxieties of the people who form the queue and their journey from the street to the space of the gallery. Through these interactions, the happenings highlighted the audience’s unique position as a community in the public space and the potential for them to share thoughts while they are waiting. In this process, the online became the starting site for socialisation. Whereas in the happenings the artist passed the three questions posed by PROJECT_16 onto to the audiences; this 18 mins. film presents the artist’s direct response to them. Rather than a documentary of what happened at Instituto Tomie Ohtake, the film unfolds as an extended part of Nishijima’s work, as her personal account of the state of art and audiences in her city. ‘How are these people trying to be part of their city?’ — poses Nishijima — ‘What do we want to show to ourselves and others by going to these exhibitions?’. In so asking, the artist deconstructs and reassembles the conversations between strangers in a new narrative, one that amplifies the project’s scope from the art and anthropological spheres to the political one. ‘To me’ —says the artist— ‘the political dimension of São Paulo as a city matters to understand why the audience of blockbuster exhibitions keeps increasing’. Taking the concept of ‘cosmopolitanism’ as a starting point, Emma Smith proposes Chora. Composed by a one-day happening in the streets of London, a workshop at the Royal College of Art and its online manifestation, Chora is an invitation to reflect on our shared humanity. 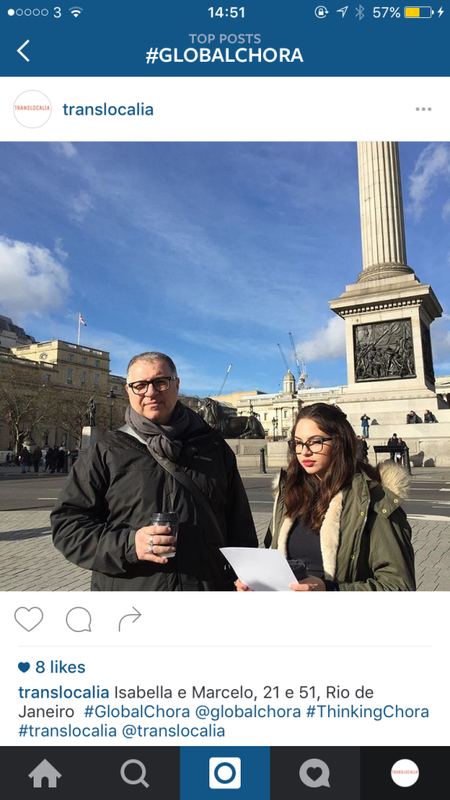 Related to a previous thought experiment in September 2015 at Kunstmuseum Luzern, the work was initiated on 9 February 2016 through a happening in Trafalgar Square, the historic epicentre of London from which all distances to other cities are measured. 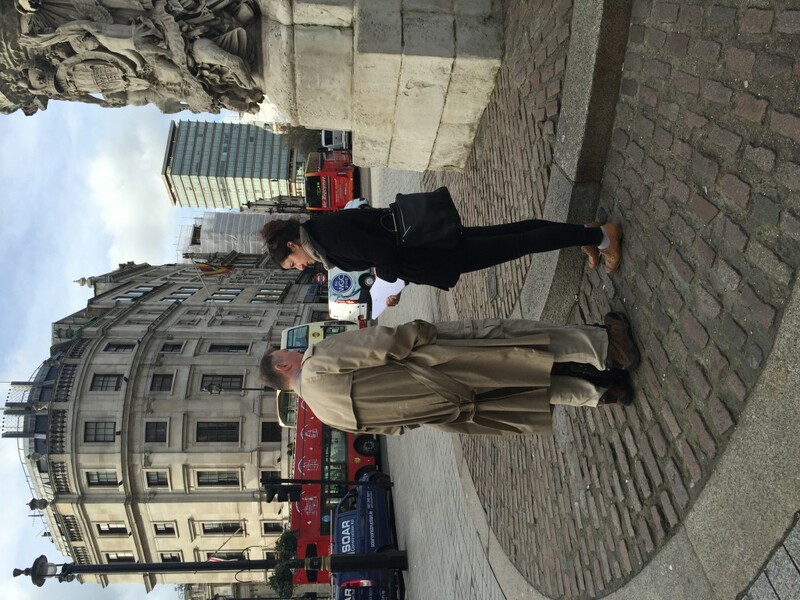 The point marked by a plaque on the floor at the southern edge of Trafalgar Square served as a site to test the public nature of the city space and the modes of contact and exchange it affords. From this symbolic location, the artist started the dissemination of ‘chora’, a term derived from Plato as pertaining to a third space beyond the city. Through her interpretation of the Platonic ‘chora’, Smith proposes to found a new state, ‘a state of mind’ solely dependent on the power of thought, as a way of enabling the possibility for a global citizenry, free from conditions of citizenship, definition or border. Based on this notion, passers-by were invited to take part in the artwork by means of taking a minute to imagine what it means to them to be a citizen of the world. What does it mean to have a global citizenry based on difference? What is the role of the city space? Through this happening, manifested as a ‘state of mind’, Chora’s meaning and actuality became entirely dependent on each person thinking it and as numerous and various as its participants. As a way to capture the traces of this thought experiment and spread further the notion of Chora, participants are invited to post their silent pictures online and follow Chora’s social media accounts (@GloablChora #GlobalChora); sites that don’t post anything but just collect followers. In so proposing, the artist expands the scope of the work to the extended public domain of the World Wide Web. So Chora’s existence is established, consolidated and circulated online. Conceived as curatorial research to challenge the principle of the ‘contemporary’ exemplified by biennales, PROJECT_16 is the first initiative of translocalia.com: a network of artists, designers, curators, audiences and professionals from different domains to discuss, share and plan for the future through art. Developed by Barcelona based designers Eva Domènech, Laura Quintana and Claudia Oliveira, the website acts as a public domain where to address the query ‘what do we want to add to the world and why?’ (Maria Lind, Art Forum, October 2009). Thank you for sharing this curatorial project, Amanda (and Lavinia). I find very important the starting question (‘How would you like art to engage with your city in 2016?’), as it is something that is rarely asked and instead directly enacted (policies and projects are developed, before asking people how would they like to engage with such projects in the city). Do you think this way of working also pushes you to reconsider your own roles as curators? Is this something you somehow ‘negotiate’ throughout the process by means of how the projects develop? Hi Pablo, many thanks for your comment, it is great to discuss PROJECT_16 in different contexts! The question you are referring to (‘How would you like art to engage with your city in 2016’) is, in fact, one of three initial questions that we posed to and discussed with our collaborators in the three cities (the other ones being: ‘How do you encounter art in your city now?’ —as a way to describe the context and analyse the operating art infrastructures— and ‘What kind of effect does it have?’ —as a way to identify the effects of these institutions in relation to the publics they address and their limitations). So by relating the question to a possible shift in our curatorial position you have touched upon one of the cornerstones of the project. PROJECT_16 started as an exercise of re-thinking curatorial paradigms, specifically the notion of the curator as a care taker of artists and art works and preservator of knowledge and creator of values. We initiated it as a curatorial strategy to challenge the notion of the ‘contemporary’ exemplified by collective international exhibitions or art fairs. What irritated us from these kinds of events is that —responding to market imperatives among others— artists and curators to often act as commentators of a plural world in motion that deliver ‘ready-for-consumption’ cultural products to audiences. By contrast, we see the curatorial as a field for cultural ignition, which displaces the centre from exhibitions, artists and curators and moves towards society itself. The cultural ignitor is someone using her/his specialised knowledge to trigger some kind of change in society, rather than just sending off a statement inscribed within a dominant discourse. It involves thinking of a more cooperative paradigm, so a repositioning of roles, relations and ideas is inevitable. Drawing from Clair Bishop’s prolific discourse on participatory practices and art reception, we reacted against what she describes as ‘art consumption by passive bystanders’ and defined our position along her line of theory: ‘there must be an art of action, interfacing with reality, taking steps —however small— to repair the social bond’ . In relation to Bishop’s position, we identified the term ‘microrevolution’ by Felix Guattari as a possible response. Described as the ‘necessity of small scale action in a localised, informal context, to trigger ructions and thus wider societal change’, the idea of ‘micro-revolution’ worked for us as a horizon to walk towards, in spite the high claims that could be assumed from the combative tone of the term. All this, defines the conceptual framework we have been operating from with regards to your comment. And, of course, in practical terms all this turns into a huge amount of negotiation! But we do believe it is worth to ask these questions directly to people. Our goal for the future with the ongoing network translocalia.com is clear: to articulate a network of artists, curators, policy makers, agents from different milieus and disciplines in sum, in change-oriented interactions. 2]Félix Guattari, Soft Subversions. Texts and Interviews 1977-1985, (Los Angeles: Simiotext(e), 2009), p.
Thanks for your swift and comprehensive response, Amanda! It gives me greater insight into your project and approach. In regards to the reference to ‘negotiation’, I believe it does not conflict with ‘asking direct questions’, but it is actually a part of it; negotiation is actually in the opposite spectrum of ‘compromise’. But perhaps that is more clearly articulated through the overall institution (Translocalia) that you are building…? Hi Pablo, sorry for the delay this time! Yes, translocalia.com is the articulation of the idea of negotiation through its network. As I introduced on my latter comment, we see the curatorial as an arena for ‘cultural ignition’ rather than as a place for setting and canonizing values. The idea of ‘cultural ignition’ is a re-formulation of Chantal Mouffe’s concept of ‘the political’, which refers to the antagonistic characteristic intrinsic to society. According to Mouffe, if ‘politics’ are ways of looking for consensus, ways of looking for affiliated members to a dominant discourse; the job of ‘the political’ is to acknowledge antagonisms and provide them with a legitimate form of expression. Drawing from her theory, the idea of the curator as the ‘cultural ignitor’ puts none-display based practices, publics and collectivity at the centre to challenge dominant discourses through an exercise of constant negotiation between dissenting agents. 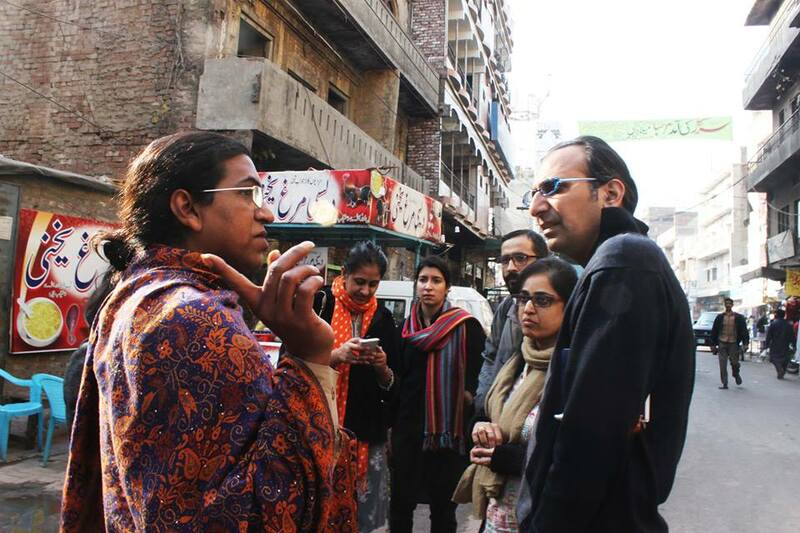 For instance, in the case of Lahore, we have worked with the Awami Art Collective, the group of artists, activists and academics and with the neighbours of the Walled City to produce a work that reads directly as a critic to governmental restrictions. But at the same time, we have been meeting and discussing the project at length with the government as they are the policy makers in the end. Or in the case of Paula Nishijima, who started her work in the line of institutional critic, we have all worked with the specific institution (Instituto Tomie Ohtake) who in the end welcomed, helped in kind and got involved through their educational team in Nishijima’s work. We are now working on strengthening translocalia’s network in the cities we have been operating and broadening it to other cities where we are preparing our next projects, so there is still a lot of work to do in practical terms…But if you are keen on the conceptual framework we are using in relation to negotiation we can send you the ‘cultural ignitor’ related paper! At the moment I have no question for you but soon enough I’ll flood you with inquiries. I just want to say that this is one of the more interesting things I’ve read in curating over the past two years. My own works looks to curating through a knowledge lens (organisational studies etc…) to see how the role of curator can be further utilised as a knowledge operator towards a richer collective negotiation. 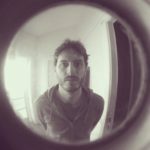 By richer, I imply, employing a myriad of techniques and knowledge types to further the a dialogical encounter. I have yet to situate my work in Mouffe but I see the logic in it. At the moment, I’m still working out the knowledge components. I’ve been rather perplexed by the conservatism of re-thinking the curatorial role in the age of crisis. We read your short bio on the TRADERS website to know more about your research but do you have a project on the website too? Looking forward to talk further about the curatorial and the projects with you, I am sure we will have much to discuss!